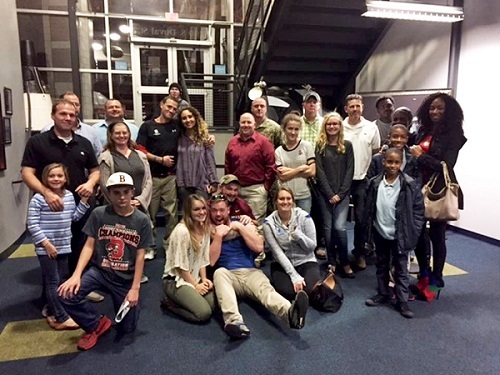 TALLAHASSEE, Fla. (Feb. 27, 2017) – Injured veterans explored the final frontier during a recent Wounded Warrior Project® (WWP) gathering at the Challenger Learning Center. As they worked together to man simulated space missions, warriors experienced firsthand what is possible at social events that get them out of the house and connected with fellow service members. Space mission participants were divided into two groups. The first attempted to land on Mars, while the second group comprised the Mars ground control team awaiting their arrival. Individuals had specific roles, including navigation, communication, satellite, atmosphere, and medical. The teams used their combined talents to solve problems like air pressure drops, malfunctioning probes, and various crew member health issues. Connection activities support the long-term recovery needs of warriors by reintroducing them and their families to the unique bonds experienced during military service. Encouraging these friendships – in settings that accommodate physical injuries and social anxieties – helps discourage isolation, which can be detrimental to the healing process. WWP staff closely interacted with attendees during the space mission, providing warriors with more personalized therapeutic outlets and advising them of additional services to assist in their recovery processes. WWP programs and services help injured veterans with mental health, physical health and wellness, career and benefits counseling, and connecting with other warriors and their communities. Generous donors make it possible for wounded warriors to benefit from program resources at no cost to them.